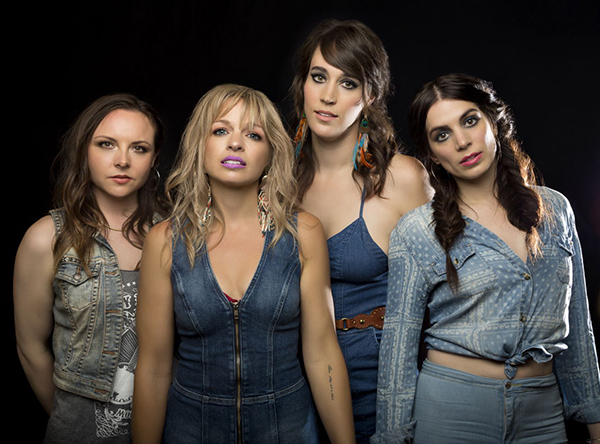 Home Arts All-female country band pulls the reins in P.A. The all-female country group is opening for The Washboard Union at the E.A. Rawlinson Centre on Nov. 24 at 7:30 p.m.
Krista Wodelet, drummer and vocalist, said smaller centres are a better market for country music. “The crowds are always way more fun,” she said. Nice Horse is also made up of Tara McLeod, Katie Rox and Brandi Sidoryk—all had previously been in the music industry in other bands or as soloists. Rox and Sidoryk have known each other the longest. Wodelet met them about seven years ago and McLeod joined the band less than a year ago after they wanted an electric guitar. “We’ve been a band for about three and a half years now and it started as just sort of a casual project. None of us were taking it that seriously, we were just friends. We were hanging out and we liked playing together,” said Wodelet, but that changed when they sent some songs to Coalition Music in Toronto. Their talents launched into being the only all-female country band in Canada. “One of the things we really try to promote among ourselves and with our fans is the idea of women supporting women. Especially now at this particular time in history, I think it’s so important,” she added. She described their music as a blend of different genres. “Although it is country music, I think it’s kind of country with an edge, like we definitely put our own stamp on it and it’s just as a result of all of our different backgrounds,” she said. Rox and Sidoryk keep country music close to their hearts, whereas McLeod is also in a metal band and Wodelet has an orchestral background. Wodelet said their new single, Six String Outlaw (The Sundown Remix), is a good example of their style. Tickets are available on the E.A. Rawlinson Centre’s website or at the box office.